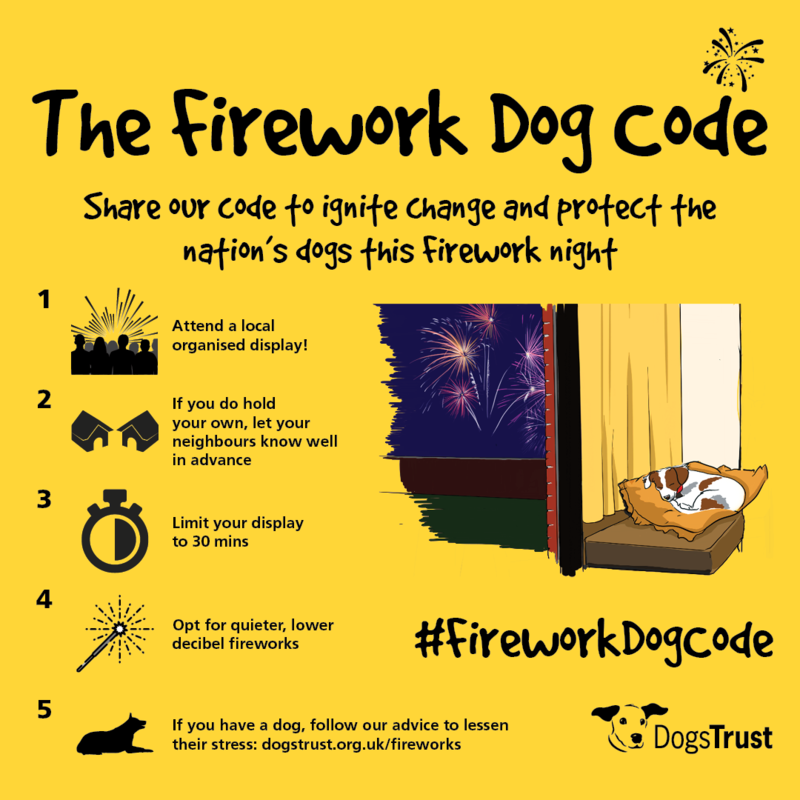 Personally, I would love to see fireworks banned from sale to the general public, and public displays limited to silent fireworks, but since they aren’t follow these tips to try and keep your dog safe and happy whilst people are having their firework displays. If you want to enjoy the fireworks – please attend an officially organised display. But please don’t leave your hound home alone, if you can’t find someone to pupsit – then don’t go. If you choose to organise your own display, please let your neighbours know in advance, choose quieter fireworks, and limit your display to 30 minutes maximum. Remember about your own dog, and think about how they may feel with fireworks going off so close to home. Try and keep them in a room furthest away from the noise, and leave the radio or TV playing to try and drown out any sounds from outside. Walk your dog before dark – make sure your dog is well exercised and has had a toilet break before the fireworks begin. Feed your dog before the fireworks begin as he may become unsettled and not want to eat during the fireworks. Make sure your house and garden are secure during the fireworks as fear may make your dog try to escape. 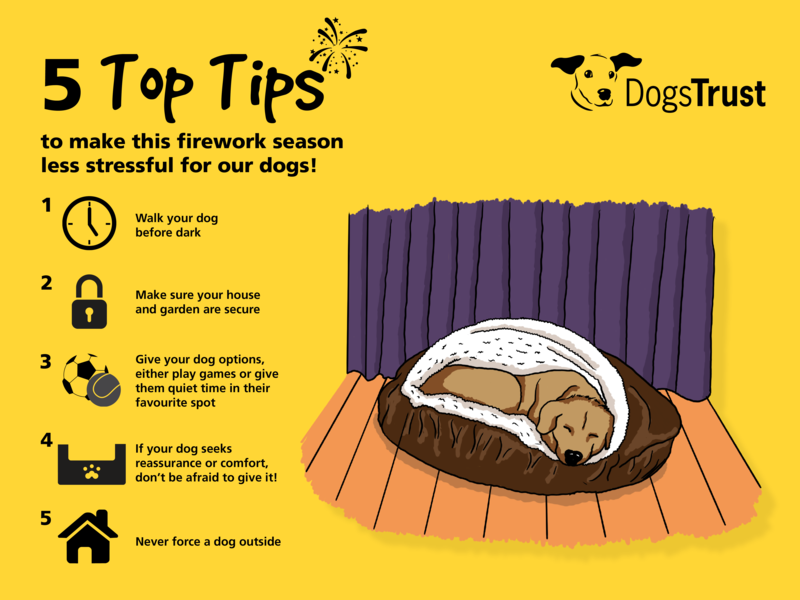 Try to settle your dog before the fireworks start – if your dog is in familiar safe surroundings it will help him cope with the noise. Provide a safe hiding place – at noisy times around Bonfire Night, make sure your dog has somewhere safe in his or her favourite room, perhaps under the table. Close the curtains, turn the lights on, and turn up the volume on your TV or radio to drown out the firework noises. Don’t punish your dog for cowering or reacting to the fireworks as this will intensify his fear. You should aim to remain relaxed and therefore provide a good role model to your dog when he is afraid. However, if your dog comes to you for comfort don’t ignore him – interact with him calmly. Don’t leave your dog alone in the house during the fireworks period – he may panic and this could result in an injury. Keep your dog busy indoors – play games or enjoy some reward-based training to keep his mind off the noises. However if he just wants to hide away then don’t force him to come out of his hiding place, allow him to stay where he feels safe. If you think that your dog gets worried by loud noises, contact your vet to see if there’s an underlying health problem first, and to help you find a qualified behaviourist. Your vet will also be able to discuss whether medication might be helpful. Establishing a consistent way for your dog to cope. This often involves teaching a dog to use a den to hide when he is worried. This might require you to gradually change your dog’s ‘coping’ response away from one that relies on your attention so that he’s more able to cope with loud noises if they occur when you’re not home. Gradually teaching your dog that noises are not scary through a process called ‘desensitisation and counter-conditioning’. This usually involves playing recorded versions of the scary noises, but starting at such a low volume that your dog is not worried by them. The volume and direction of sounds are changed over time, but so slowly that your dog does not show any signs of fear. The sounds should also be associated with something that he enjoys, such as high value treats or a game. Recorded noises for this method can be found on the Dogs Trust website. Dogs Trust Dog School have a handy how-to guide and top tips for preventing a fear of loud noises here on their website! Watch the trailer below, and the full video here.